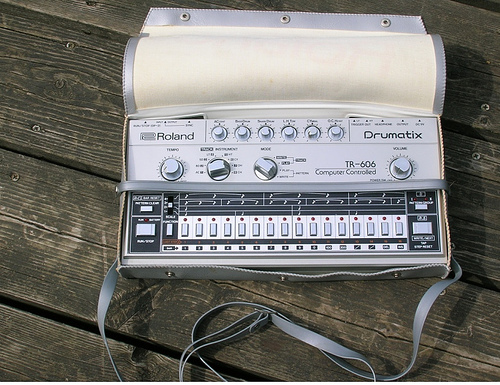 After the 303 Roland decided to create a more versatile and not limited only to basslines, a micro composer! The MC-202 is like to instruments in a little plastic box. The synth is derived from the Roland SH-101 and the sequencer is like a little MC-4 but only with 2 track (against the 4 of the MC-4) , its name could be MC-2… that’s why MC-202! The synth itself its quite simple but really versatile for the task of making arpeggios, basslines, sequencered blips and blops, and sequenced leads. There is a single VCO with SUB that can produce a saw and a pulse (with modulation)and the SUB (a square wave 1 or 2 ocyave lower or a pulse 2 octv lower). The three wave are mixed by the MIXER section , than filtered and after the the filter we have the VCA (amplification) and the ENV. The FILTER section has Cutoff, Resonance, Env (env amount) , Mod (LFO amount) , KYBD (keyboard tracking). The filter is a 24dB with resonance with the classic analog roland carachter and sound, it can act quite rounded and smooth and get acid when you turn up the resonance. With the reso at max the filter prduce a SINE wave that can be played by the keyboard using the KYBD at max. The VCA is quite simple and has only a switch, ENVor GATE. With the Env is switched the env shape the sound and the accent controls the volume, while when switched to gate the synth plays only when the key is pressed and loose the accent on volume, but ois useful for sequenced sounds when you want the ENV to control the filter only. The ENV is a simple adsr that acts really snappy and with a fast attack, really great for bass and percussive timbres. The LFO is quite simple, has only triangle wave with delay, to let the vibrato grows after a while. The sound of the machine is a cross between a TB-303 and an SH-101, maybe the MC-202 can get more aggressive /acid than the 101 while the 101 has a just a little more sub on the bass end when used to generate sub basses, but the sound is more or less the same. Maybe the only differences are made by trimpots regulations and not by any difference in electronic design. The other part of the machine is the SEQUENCER. The seq is different from the 303, is not a pattern style but a linear sequencer (just like the MC-4). This difference let the MC-202 creates longer and more complex sequences , as it has a deeper editing on note durations, gates etc, while it mantains the ACCENT (for FILTER and AMP, and it can be choosen individually, so 2 accent!) and the GLIDE (here named PORTAMENTO) with its time knob (on the 303 the time is fixed). Making a sequence on the MC-202 is harder than on the 303 if you want to get exactly what you have in mind. Vince Clarke (former member of Depeche mode, Yazoo and Erasure and famous user of old Roland sequencers as MC-8, MC4 and MC-202) is described as one of more trained user as he could compose all the song without hearing the music, just pressing the buttons and than pressed play and BaaaM! the song was perfect!! Indeed the programming of the sequencer is not the easiest, and it takes time to get into it, but it can create really great results , difficult to get with other gear. I forgot to say that the sequencer has 2 identical tracks with CV-GATE outs to play external analog synths and a DIN SYNC IN and 2 DYN SYNC OUTs and tape in and out to be syncronized to other machines or tape recorders or DAW. The MC-202 has been used mainly by all the electronic producers of the last 25 years, even if it’s not as famous or hyped as the 303. This is a great machine, and its sequencer is really a part of the strong carachter of the MC but there is also a software that can generate the data sound to load into your MC to program the sequence on your computer and than load it into the MC to get the best of both worlds.